The biggest fight card of the year took place Saturday night inside the Honda Center in Anaheim, California. 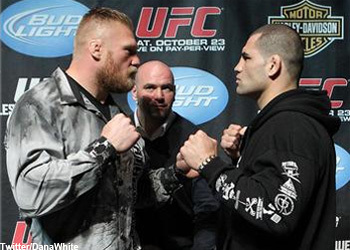 UFC 121 featured the highly anticipated heavyweight title scrap between Cain Velasquez and champion Brock Lesnar. According to UFC president Dana White, 14,856 fans packed the Honda Center in Anaheim, California, garnering the company a cool $2.15 million at the gate. White claimed that while watching the monitors Octagon-side, he thought he saw Brock Lesnar verbally submit to the Cain Velasquez. When the new king finally showed up to the presser, he said he didn’t hear anything of that nature. Velasquez said he executed his gameplan to absolute perfection. He gave special props to Olympic wrestler and Strikeforce heavyweight Daniel Cormier for their countless single-leg takedown sessions. Brock Lesnar did not attend the post-fight press conference. Former Strikeforce middleweight champ Jake Shields admitted the weight cut drastically affected his performance in his Octagon debut. Shields took a controversial split decision over Martin Kampmann in a welterweight affair. Although Diego Sanchez appeared to recapture his mojo, he wasn’t sure if he’d remain in the welterweight division. White said he loves him at that weight class, however Mr. YES gets final say.